I think you're doing fine. When you're done, wait a week. Then ask for a small favor to see if he grants it. Then you will know for sure if he's forgiven you. Thank you St Expedite for continuing to answer my prayers ! Please continue to bless me and my family with your kindness ! I will offer you my gratitude as always . Please pardon me for any mistakes if i may have accidentally and ignorantly made while praying . "The candle burned leaving a bit of a white haze on the sides of the glass, and a ring of unburned wax on the bottom. The candle also had to be re-lit. These signs point to delays, confusion, and blockages caused by unresolved past issues. Prayer and meditation are good tools for clearing away old woes. Stay strong and focused and success is still possible." I continue to give him flowers and water and Florida water. I hope the relationship improves soon because I really need St. Expedite's help with my finances. I'm thinking of including St. Jude in the mix because I really feel like a lost cause at this point. In every respect. I would definitely set up different altars for them. I would say keep doing your devotional practices to the saint. You sound very sincere to me and I believe saints respond well to sincerity. I am sure he will be able to assist in some way. Thank you Nathen. I will continue what I'm doing and hope for the best. I wouldn't bring St Jude to the mix right now. Ask St Expedite for a sign that he forgives you. ASk him for something specific. Thanks Miss Aida. I will hold off on St. Jude for now, but I do feel like a lost cause at the moment. I will ask St. Expedite for a specific sign. Thank you St. Expedite for that badly need phone call. I have been working with St Expedite over the past month for what I want to be a successful outcome. I will not know the results until the end of August, but the "active time" (when all the discussions and decisions were being made) was the month of June. What I was wondering is, should I continue my vigil through the month of July and through August, right up until I hear the results? I have worked with St. Expedite once before, keeping vigil right up until I saw the desired results, but that was in a shorter time frame, and there wasn't a definite deadline involved there. Thank you. I would definitely do that right up to the date. Thank you St Expedite for everything and continuing to bless me ! I sincerely apologize from the bottom of my heart for any mistakes knowingly or unknowingly i may have done worshipping you . Please Please forgive me . I promise to pay my respect & gratitude . Please continue to bless me and my family ! Thank you for helping me with the great power bestowed upon you from God. I am new to working with Saints. So, I would like to thank St. Expedite for all that he's done for me when I called for his help a few months ago. I am grateful to God for allowing him to work on my behalf. Thank you st expedite for listening to mt petition! This has been the first time that I worked with Saint Expedite. My understanding is that if he doesn't come through by the agreed time that one should not provide the agreed upon offering. However, I received a very clear communication from him this weekend that he "did all that he could do" in the situation and I really feel like making an offering of some sort. My impression is that he wants the normal offering of poundcake, pennies and red candle without the public thank you. I also would like to get him a proper icon for my house. If you have received this clear communication from him then, by all means, please give him the offerings. After al, he did try for you and on your behalf. Thank you, St. Expedite for coming through once again. I apologize if one of these questions may have already been answered. I started a petition with Saint Expedite last Wednesday and the original candle burned out the following Tuesday (only 6 days) so I lit another one. However, I am going to have to go out of town this Monday and the current candle may not be fully burned out. Technically, today (Friday) would be the end of the nine day period, and the petition has not been granted yet. So, I guess I have a few questions. 1) Should I let the candle burn beyond the nine days and continue with prayers? 2) And then, by going out of town on Monday, I know I'd want to snuff it out... would I just restart the novena when I return (which would probably be Friday) or just stop because the nine days have passed anyway? 3) If the petition is granted or there are signs while I am gone, would I give the offering where ever I am located, or should I be proactive and leave roses and cake here back at home even before the petition would be granted? Finally, here may be a crazy question but is it okay to wrap up the cake in clear wrap (especially if I were to leave it)? (We have an interesting ant problem due to a wooded area). Just tell St Expedite that your Novena has been completed and snuff it out (but tell him that you will continue this extra offering of the candle when you return). Then, when you return, just light the candle and tell him it's an extra light for him to enjoy. Also, tell him that if the petition is granted while you are away, you will give him your offerings when you return home. So, that answers all of your questions! You definitely answered my questions and it is good to know that I had actually already taken the first step when I snuffed it out. Thank you St Expedite for all you've done! May others know if your generosity and willingness to help! Hello everyone in to all be bless I'm in need of help I have lost a good friend Saint Expedite is who I mean I notice a change when I petition to him that now nothing happens I don't no where have I went wrong I always give a public thank you or donation I don't no I'd it's been a time I forgot but I really feel low,depressed,in weak I really do miss him helping me I have went on a website of his to plead,beg in ask for forgiveness but I really don't no at this time someone please help me earn my trust back with him please I'm not really not able to do candle work because of my grandparents home in sometimes everyone in the house is in every room or even if I do have time to burn a candle I would have to snuff it out as someone will be coming I can't burn in my bedroom because I share a room. is there another way I really feel like I lost a true friend please help me someone. Did you do something to upset him? You're asking for forgiveness. So, what happened? Thank you St. Expedite for your help with my situation. You really came through for me. Thank you, St. Expedite, for helping me with my petition! It seems Saint Expedite has forgiven me for going back on my promise. I've been faithfully donating $25 every payday to Catholic Charities since a reading revealed that my broken promise might be causing me problems, particularly financial. My vigil candle dedicated to him burned clear for the first time. I'm still nervous to ask for anything. Should I wait to see if the current candle burns clear before I start petitioning him again? Thank you, St. Expedite, for granting my petition. You are truly miraculous. Thank you, Guardian Angels, who have helped me on numerous occasions and have saved me from physical harm three times this year. I am, as ever, grateful and humbled by your protection. Whatever you do , is for my best . Please forgive me for any mistakes i may have made . I was wondering, can St Expedite be petitioned for love drawing work? I think I remember reading somewhere about a love spell with St Expedite. Though, I could be wrong. Any advice will be helpful. Thanks! I would like to Thank Saint Expedite, The Infant Jesus of Prague and Holy Spirit for prayers answered speedily. I did a glass encased red candle for saint expedite and it finished rather quickly in 4 days I asked him for the person that owes me to pay me and for the loan I applied for to be approved. The person told me they would pay but never did and I haven't heard anything from the bank for the loan. Should I still pay him or should I light another candle and ask again? You might want to give it a little time to see if your work manifests before declaring it done. I would still pay him then do another candle after you are sure there is no more movement from this one. Thank you saint expedite for making the person pay the loan I will give you red wine and pound cake. Thanks for your fast blessings. I promised him pound cake yet live in an apt and I'm concerned about bugs...where i can i place the cake offering? Thank you st expedite for your good works! Thank you St. Expedite for coming through so consistently and swiftly. Much love and respect. I would put it on the same altar that you did the work and in front of an image of him. Thank you St Expedite for your continued Blessings in my life ! Well, my ex is very stubborn. I had a Pay me candle burning. I quit contacting him on 0ct.2nd 2015. Just recently I asked St. Expedite to please step in and have him return my money. Also to text or call by Oct 31st. My ex texted me Oct 11th 2015. He asked how was I doing. I was happy but then it was to ask me for money. He owes me over $500. But says it's only $100. I don't want to question if this was St. Expedite doing of having him text. I will wait a few days and ask St. Expedite again near his pay period for help. Also, I tweeted about St. Expedite and thanked him. I just laid out the pound cake 3 slices and put pennies and nickels in it. I have fake flowers of red and white already on my altar. I also put out a glass of water as promised and lit a white candle. 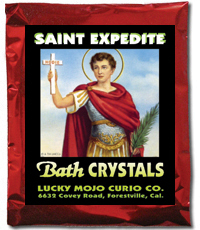 Lastly, I will be thanking you St. Expedite here on the LuckyMojo site as well. Thank you kindly St Expedite. I appreciate the speedy response. I hope I did everything correctly. Also 2 days in a row I didn't light candles. I did it once. The next 2 days my St Expedite card I printed out was knocked over with his face covered. 2 days in a row. I decided to just lay him flat. It happened after I mopped my house with ammonia for a cleanse. It was so weird. I apologized to the Saint but I'm still puzzled as to why it happened. It is my belief that ammonia should not be used close to where Saints are being actively petitioned. Use a frgrant wash or mix the saint's bath crystals in warm water and gently cleans the site. One packet of the crystals will last a long time if the space is small. Store them in a clean glass container with a lid after opening, to keep the scent fresh. But, my guess is that it could also have happened because you missed a couple of days. Also, don't leave him face down. Start all over again and tell him that you just didn't know. Saints are forgiving for things we just didn't know! Thank you for the response. Yes, I made sure to turn St. Expedite on his back since something kept turning him face down. I never knew that about ammonia. I will not use it again. I'll do salt or just bless the water with prayers. Well, as stated my ex called like he wanted to check on me. But I think it was just to beg. Today Friday was the day he promised to pay me $200 if I loaned him another $100. So, he tells me he has $50. Then he quit responding. Me being me I lashed out with anger because of my hot temper. So, no money again. I feel foolish caring for and loving a person who continues to hurt and lie to me. Because he whines about not having any money left over from his job. I just had faith he would pay me. I'm trying not to do a green devil spell because I'm a little afraid. I need to see what the heck is going on and why can't I break away from him. Thank you. candle but I think he is resentful with me, What can I do? Perhaps you ought to try the Pay Me spell? I would buy him an entire pound cake and give him a fresh slice everyday. I would also light candles for him (without any requests) and ask for his forgiveness. Continue the flowers and water. Now, I can't speak for a Saint, he may forgive you. Only time will tell. Please do not ever do this to any Saint again. Just remember that we are nothing compared to their powers. Big Thank You to Saint Expedite! A few days ago I petitioned St. Expedite to help a non-profit group that was having trouble with red tape. They'd invested $2000 in a project that suddenly lost approval because of one difficult city board member. It was a mess and unexpected setback for the group. I asked St. Expedite to clear up the situation and convince the troublemaker to let it go. Today I received an excited voicemail from the non-profit's founder saying "You won't believe this, but we got approval! Total reversal of ruling in our favor!" I was stunned – and yet not. Saint Expedite always comes through. I'm not even surprised that it happened within three days. He is the man, and well deserving of all the praise and good press. Thanks again Saint Expedite. You're amazing! 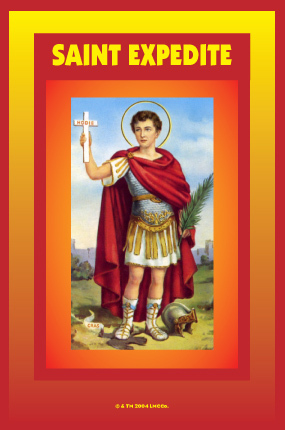 A big thank u Saint Expedite for answering the prayer ipetitioned today. I petitioned u along with Saint Anthony just today and i know u work hand in hand together for to give me a fast miracle. please continue to help me. i love u both. il pay u soon with pound cake and flowers. . Thank u! Thank you oh Blessed Saint Expedite. One of my commission payments did not work out the way I had planned last week and I found myself on the verge not being able to make my car payment and suffering huge embarrassment with my business because I wouldn't be able to keep up with an investment I committed to. I came to you asking for your intervention and I was really scared of the repercussions particularly how I would be able to keep my car. You stepped in and got me approved for a line of credit that more than satisfied this issue. I made my car payment and all is well with my business. My credit stinks and I have gotten quite a few rejections from other places prior to talking to you so I knew this had to be you. Thank you so much Blessed St. Expedite. Thank you in advance for your on-going help. As a token I will continue giving you the offerings that I promised and spread your praises as we work together to build a beautiful legacy for me and my family.